Sparrow-like. Brownish-gray above, with faint streaking, except on the hindneck and rump; breeding birds have a grayer tinge on back; uniform buffy underparts, with moderate streaking; buffy eyebrow; mostly dark bill; dark legs; and white outer tail feathers. Behavior: Has habit of nervously pumping tail. Habitat: Migrants found in open plains, fields, and bare shorelines. Generally prefer moist to wet habitats over dry ones. Where in Nebraska: Common spring and fall migrant across Nebraska, and a rare winter resident. 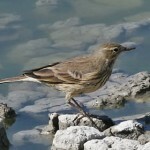 Fun Facts: American Pipits may benefit greatly from Global Warming which will allow them to breed farther north than usual, however, this may result in more fragmented populations. 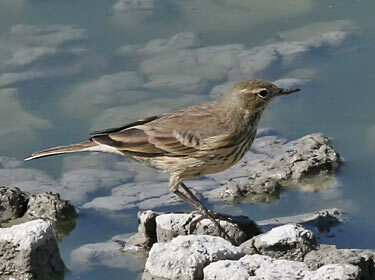 Additional Information: Formerly called Water Pipit. 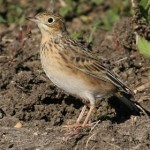 Apparently more abundant and much more conspicuous than Sprague’s Pipit.